OMAHA, Neb. – Through the Direct Your Dollars™ program, the AllPlay Foundation recently received a $1,000 donation from SpartanNash and the company’s Omaha Distribution Center. Direct Your Dollars is offered at more than 150 SpartanNash-owned stores in nine states – including all 26 Family Fare Supermarkets, Supermercado Nuestra Familia, No Frills, Family Fresh Market and SunMart locations in Nebraska – and gives store guests and SpartanNash associates a way to support their favorite local charities, schools and nonprofit organizations. In this case, SpartanNash Omaha DC associates collected the receipts and selected the AllPlay Foundation to benefit from the donation. Omaha DC Warehouse Assistant Kevin Terry, Administrative Assistant Hazel Arnott and Papillion Family Fare Store Director Donnie Wilde presented the $1,000 check to AllPlay Foundation Founder and Executive Director Bruce Froendt on behalf of SpartanNash and the Direct Your Dollars program. 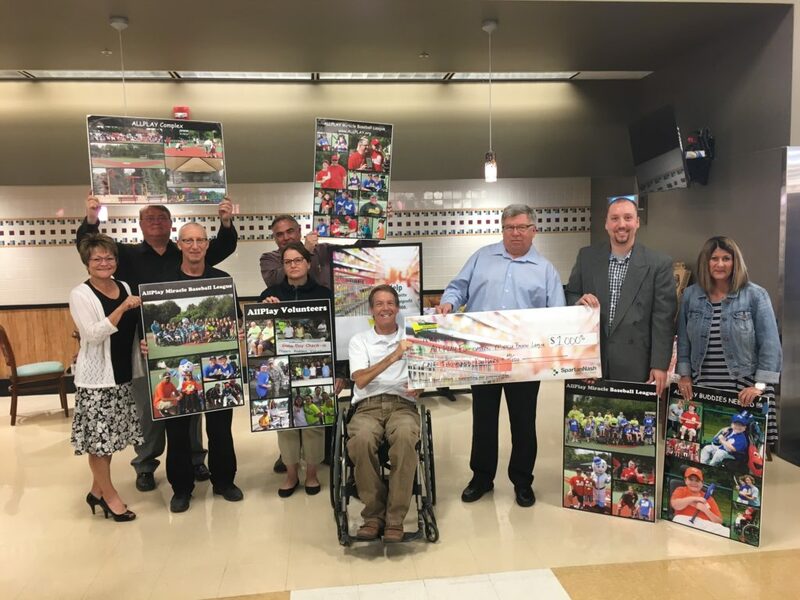 The money will be used to support the AllPlay Complex – the finest barrier-free sports and recreation complex in the nation – and the 2017 AllPlay Miracle Baseball League, which began on May 6 and runs for eight weeks. The $1.5 million AllPlay Complex is located in Seymour Smith Park in Omaha, utilizing barrier-free design concepts that allow people who have mobility impairments and other disabilities to fully enjoy sports and recreation. The complex is open to the public and includes the AllPlay Miracle League Baseball Field, Nebraska Barons Wheelchair Softball Field and a playground, waterpark and Welcome Center. Terry organized the receipt collection in the offices at the Omaha Distribution Center, which grew to encompass the entire warehouse and other associates in the company. “We have receipt drop boxes placed throughout the DC, and everyone who wants to participate can place their receipts in the boxes,” Terry said. “It’s become a habit for a lot of associates, which made it easy to reach our $150,000 goal in six months. Direct Your Dollars was launched by SpartanNash in August 2016, encouraging store guests and associates to use their purchasing power to support their favorite nonprofits just by shopping at any one of SpartanNash’s more than 150 retail stores and fuel centers. The Direct Your Dollars program allows local nonprofit organizations to turn $150,000 in receipts into a $1,000 donation, which can then be used for computers, textbooks, field trips, athletic and band equipment, food and meal supplies and much more. Participating groups must have a valid 501(c)(3) determination to be eligible to receive a donation. Preschool and K-12 schools are eligible to participate, as well as school-sponsored groups and clubs. Faith-based and community service organizations can also participate in the Direct Your Dollars program.